Widely used in civil, mechanical and automotive engineer­ing since the early 1980s, multilayer rubber bearings have been used as seismic isolation devices for buildings in highly seismic areas in many countries. Their appeal in these applications comes from their ability to provide a component with high stiffness in one direction with high flexibility in one or more orthogonal directions. This combination of vertical stiffness with horizontal flexibility, achieved by reinforcing the rubber by thin steel shims perpendicular to the vertical load, enables them to be used as seismic and vibra­tion isolators for machinery, buildings and bridges. Mechanics of Rubber Bearings for Seismic and Vibration Isolation collates the most important information on the mechanics of multilayer rubber bearings. It explores a unique and comprehensive combination of relevant topics, covering all prerequisite fundamental theory and providing a number of closed-form solutions to various boundary value problems as well as a comprehensive historical overview on the use of isolation. Many of the results presented in the book are new and are essential for a proper understanding of the behavior of these bearings and for the design and analysis of vibration or seismic isolation systems. The advantages afforded by adopting these natural rubber systems is clearly explained to designers and users of this technology, bringing into focus the design and specification of bearings for buildings, bridges and industrial structures. 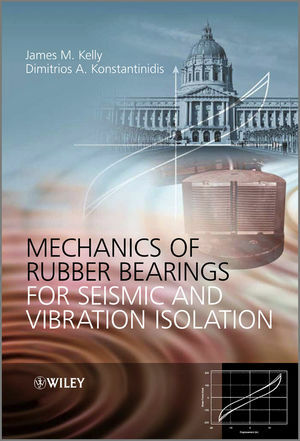 The concise approach of Mechanics of Rubber Bearings for Seismic and Vibration Isolation forms an invaluable resource for graduate students and researchers/practitioners in structural and mechanical engineering departments, in particular those working in seismic and vibration isolation. James M Kelly is a Professor in the Graduate School, Department of Civil and Environmental Engineering, Division of Structural Engineering Mechanics and Materials at the University of California at Berkeley, and a Participating Faculty Member at the Earthquake Engineering Research Center, University of California at Berkeley. He has authored over 300 refereed journal papers and 2 books, Earthquake-Resistant Design with Rubber 2nd ed 1996 (Springer Verlag) and Design of Seismic Isolated Structures, 1999, Wiley. He has led the way in experimental investigations of elastomeric seismic isolation bearings by conducting many pioneering studies of seismically isolated structures and structures with energy dissipators. In testing hundreds of bearings he achieved numerous advances, including the application of high-damping rubber for seismic isolation bearings - used in the first U.S. isolated building and in more than 100 structures around the world and the understanding of the dynamic and ultimate behavior of elastomeric seismic isolation at large deformation. Dimitrios A Konstantinidis is a Postdoctoral Researcher on health monitoring at University of California, Berkeley, working on the development and testing of a reliable scheme for monitoring the health of fluid viscous dampers in bridges via wireless communication.